The AP Biology course is designed to enable you to develop advanced inquiry and reasoning skills, such as designing a plan for collecting data, analyzing data, applying mathematical routines, and connecting concepts in and across domains. 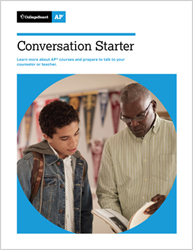 The result will be readiness for the study of advanced topics in subsequent college courses — a goal of every AP course. This AP Biology course is equivalent to a two-semester college introductory biology course and has been endorsed enthusiastically by higher education officials. The key concepts and related content that define the AP Biology course and exam are organized around a few underlying principles called the big ideas, which encompass the core scientific principles, theories and processes governing living organisms and biological systems.